Tampa, Fl. 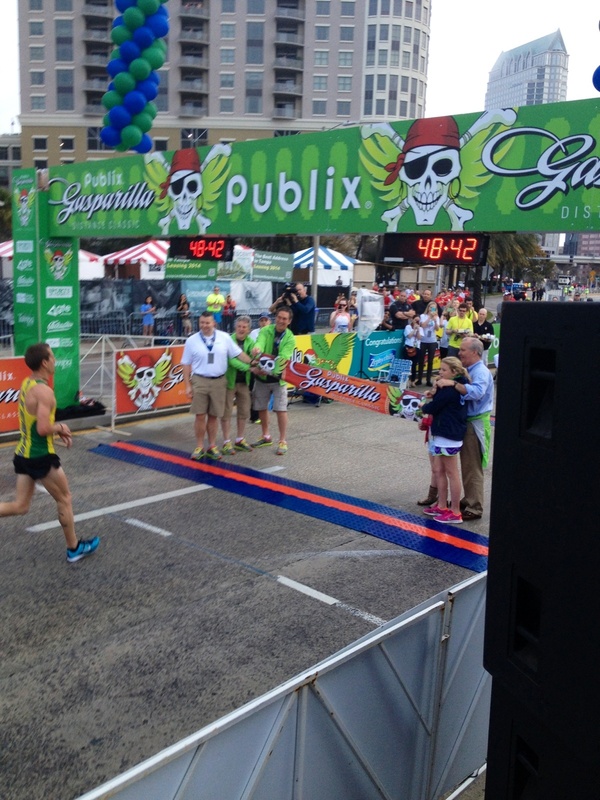 — A temperate 70 degree air temperature was blanketed by 100% humidity today as thousands of runners from the region, state, and nation took part in the 37th running of the Publix Gasparilla Distance Classic 15K and 5K along Bayshore Boulevard. Tomorrow, the half-marathon and 8K take center stage. In the local 15K showcase, in which $10,000 was split between the men’s and women’s divisions, Tampa’s own Jon Mott and Sara Petrick took home the $2000 first prize purses for their respective wins. Both had finished second in 2013. This year Mott’s unofficial time was 48:43, some 53-seconds slower than in 2013, while Petrick posted a 34-second improvement over last year with her unofficial time of 55:47. Mott was challenged early by 19 year-old Polish native Rafal Matuszcak, but pulled away just after the six mile mark, and could cruise home unchallenged, saving himself for a go at the half-marathon tomorrow where he is the defending champ. Runners ranging in age from Caleb Roda, age 5, to 84 year-old Lawrence Barrett made their way from downtown Tampa along Bayshore Boulevard and back under slate gray skies and eventual rain late into the 5K. 77 year-old New England snowbird Bill Riley may have posted the best performance of the day, completing the 15K course at a 7:30 per mile clip, and then complained afterward how he’ll probably pay tomorrow for the pounding he put his body through on the all concrete course. Tomorrow a well-matched field of American pros will take on the half-marathon distance, and vie for a purse of $30,000, while a separate 8K will be on offer for many of today’s runners going for a three or four-peat on Tampa’s most celebrated race weekend. 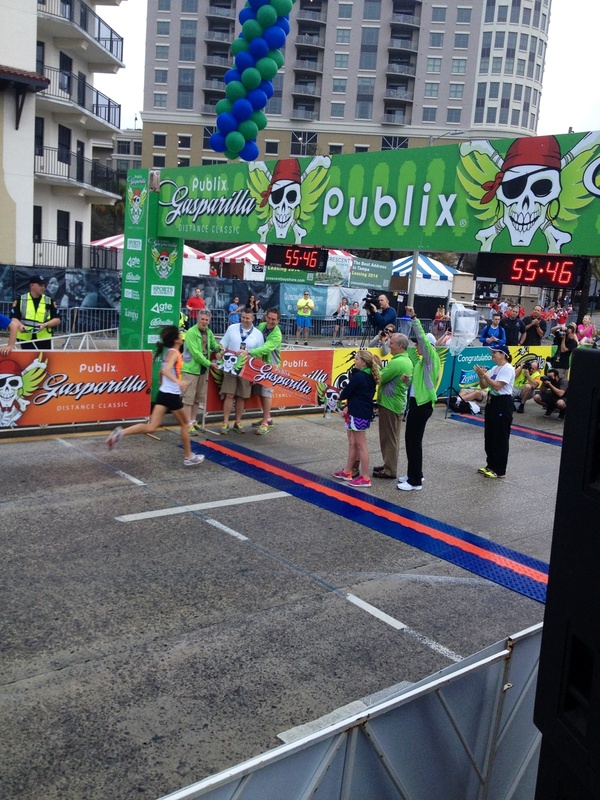 This is the first time since 1997 that prize money will be on offer at Gasparilla. 22 year race director Susan Harmeling addressed the elite field at this afternoon’s technical meeting. “We are excited to have you all here,” she began. “We elected to do away with prize money after 1997, thinking it would be best for our event. But when the elites went away a lot of the excitement and energy out on the course went missing, too. Among the favorites in tomorrow’s Gasparilla Half-Marathon are Tucson’s four-time Olympian Abdi Abdirahman; Villanova grad Bobby Curtis, a member of the Hanson-Brooks Distance Project training in Cleremont, Florida; Ryan Vail of Portland, Oregon; along with a host of Boulder’s best, including Fernando Cabada, Tyler McCandless, Patrick Rizzo, and Jeff Eggleston. The Boulder boys have had a rough go of it this winter, shivering in sub-zero (F) temps, then dealing with scouring 60 mph winds this past week. Though the humidity here in Tampa has topped out at 100%, none of the Coloradans was offering a complaint. And it hasn’t been any better in the great Northwest, either. Ryan Vail had to travel by choo-choo train from his home in Portland, Oregon to find non-icy streets in Seattle on which to train. He has his eye set on the London Marathon April 13th where he hopes a 2:10 or better awaits. 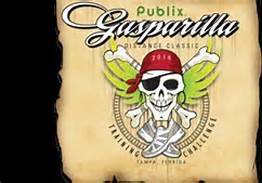 Gasparilla should give a good indication where his training has taken him. Still under the tutelage of his Oklahoma State coach Dave Smith, Ryan won last fall’s Rock `n` Roll San Jose Half in 1:02:46 coming off a 150 mile training week leading up to a 13th place finish at the York City Marathon (2:13:23) in November. Fernando Cabada will be pacing the 2:10 group at London, so this race will give both him and Ryan Vail a chance to link up early and explore their rhythms. Today’s high humidity broke somewhat this afternoon, and could lead to some PRs. If nothing else, with the quality of the field a new event record will surely be set. Today’s 15K champion Jon Mott won last year’s half in 69:50. That time may well resemble the women’s win tomorrow more than the men’s. American Distance Project athlete Matty Suver is expected to contend for the women’s title and the $8000 first-place prize. The Wyoming native training in Colorado Springs is coming off an impressive third place finish at last weekend’s USATF Cross Country Championships in Boulder. Her confidence should be brimming. Boulder-based Adriana Nelson, the 2013 U.S. Women’s Half Marathon champion, is also fixated on taking that $8 grand prize, too. She’s in Tampa with her husband, Jeremy, and has been averaging 110 miles a week back home in the harsh Colorado conditions. She’s prepping for the April 21st Boston Marathon, and is completely captivated by the expectation. You know what, Adriana? The same might be said of Gasparilla. I’ll have a report following the race tomorrow morn.